The Korey Stringer Institute recently installed a $700,000 heat laboratory at the University of Connecticut to explore the effects of temperature on individuals such as soldiers and athletes. The MISSION Heat Lab is named after the sports apparel company which athletes such as Dwayne Wade, Serena Williams and Drew Brees support according to its webpage. The facility uses state of the art equipment to control climates for tests. “Featuring a 450-sq. ft. environmental chamber capable of precisely controlling ambient temperature from 40°F to 110°F, humidity from 20 percent to 90 percent and radiant heat simulating from full cloud cover to unobstructed sun, the facility is prepared to simulate the thermal environments faced by athletes, warfighters and laborers,” Luke Belval, director of research at the Korey Stringer Institute (KSI), said. According to Belval the lab also features various pieces of high tech testing equipment, including high speed treadmills, bike ergometers and an in depth physiological monitoring system, to apply exact exercise intensities and accurately measure the subject’s bodily responses. The MISSION Heat Lab is a component of a larger KSI program at UConn. The larger program, which is known as the “Human Performance Laboratory,” is housed in the Department of Kinesiology in the College of Agriculture, Health and Natural Resources at UConn’s Storrs campus according to Dr. Douglas Casa, CEO of KSI. 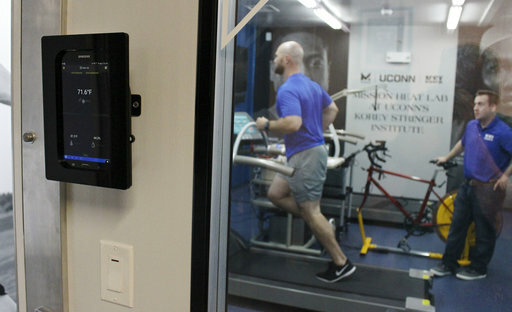 Tests for athletes at the Human Performance Lab include the lactate threshold test, which measures when lactate builds up in your blood from physical activity, and the VO2max test that measures athlete’s’ aerobic capabilities according to the KSI UConn lab homepage. The funds for the lab were provided by the NFL. The Korey Stringer Institute (KSI) is named after the Minnesota Vikings lineman who died of heat stroke in 2001. Stringer was one of 7,233 heat-related deaths reported between the years 1999 and 2009 according to the Center for Disease Control. According to UConn Today, the lab will be open to testing from outside companies and groups to further the study of heat related illnesses and boost public awareness.